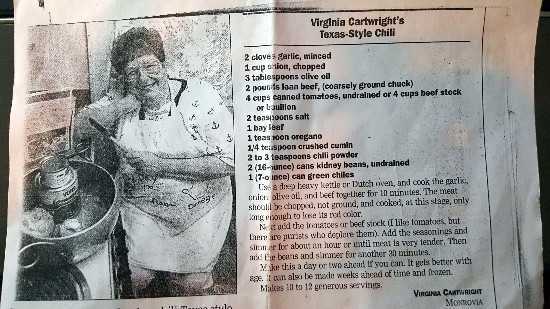 This is a recipe from my 2nd mom Virginia :) and it's so good it made the newspaper some 10+ years ago in Monrovia, CA. Great for those football parties and of course anytime! I really hope you give this a try because once you do, it will become one of your favorites! Next add the tomatoes or beef stock (again we use the tomatoes as does Virginia, but she mentions beef stock for those that don't like tomatoes). Add the seasonings, salt, cumin, bay leaf, oregano, and chili powder and simmer for about an hour or until meat is very tender (if using chopped chuck). Add the kidney beans and simmer for another 30 minutes. Make this a day or two ahead if you can. It just gets better with age. It can also be made weeks ahead of time and frozen. Makes 10 - 12 generous servings.